More than 80 years ago, Jewish engineer JOSEF GANZ amazed the people of Frankfurt by racing his revolutionary MAY BUG prototype over the city streets and sidewalks. This lightweight, rear-engined car was part of his dream for the German people: a Volkswagen that anyone could afford. Two years later, Ganz presented his ‘German Volkswagen’ before Chancellor Adolf Hitler at the 1933 Berlin motor show – but as a Jew, he was soon arrested by the Gestapo and any connection between him and what soon became “Hitler’s Volkswagen project” was erased from the pages of history… until today. We would like to thank the many supporters of our recent Indiegogo crowdfunding project to restore the 1933 Standard Superior Type 1! We were able to collect €14,247 or 32% of our goal during the timeframe given by the Indiegogo platform. Together with some additional donations this was enough to get started (click here for more information about this exciting project). 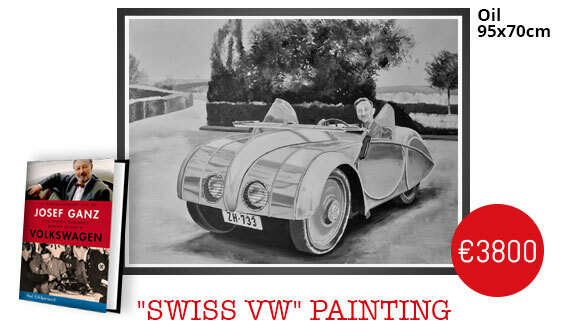 Swiss VW Painting: Support our projects and get hand-made art in return. By donating €3800 with the below PayPal button you will receive a unique painting of Josef Ganz in the “Swiss Volkswagen” by Guatemalan/Swiss Painter Hugo Godinez Solórzano + a signed biography of Josef Ganz. Oil on canvas, 95 x 70 cm, including hand-made high quality frame from Einrahmungen Godinez. €2000 will be paid to the painter while €1800 will be used for our projects. Please note that additional shipping charges and/or taxes may be applied. Find more information about the car and a bigger picture of the painting by clicking here.